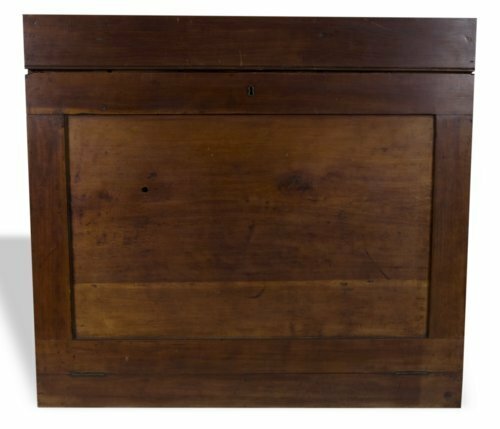 This desk was brought to Kansas Territory by George W. Clarke, an Indian agent, slave owner, and ardent slavery supporter. A notorious proslavery leader during the Bleeding Kansas era, Clarke was suspected of killing a free-state man, Thomas Barber, near Lawrence in 1855. He was never convicted. In 1856, Clarke sat reading by this desk at his home near Lecompton when someone shot at him. Clarke was uninjured but the desk did not fare as well. The bullet passed through the front of the desk and left a divot in the surface of the drawer directly behind it. The hole left by the bullet can be seen in the image of the closed desk as the dark spot below the keyhole and near left-center. Clarke was eventually driven out of the territory in 1858.